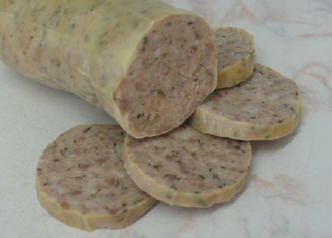 Hog’s pudding is a type of sausage produced in Cornwall and parts of Devon. Most versions of the recipe comprise pork meat and fat, suet, bread, and oatmeal or pearl barley formed into the shape of a large sausage – also known as ‘ Groats pudding’ and are very similar to a white pudding, more unusually others versions of the recipe contain a high percentage of offal and can more accurately be described as a sort of West Country haggis. It is much spicier than white pudding as it contains black pepper, cumin, and garlic. The sausage is usually around two inches in diameter.